Lately, however, the tide has turned. Specialty healthcare providers — including mental health and behavioral health providers — have begun to demand EMRs designed specifically for their needs. In some cases, that involves medical EMRs with robust, well-constructed modules focused on their specialty. In many other cases, however, behavioral health providers are opting for specialty-specific systems. Before we jump to the top 7 behavioral / mental health vendors, we want to help guide you with some criteria to make your decision. If you’d like to skip to the vendor recommendations, click here. Choosing a behavioral or mental health EMR can be very complicated, since you need to find one that works for your specific practice. Searching for behavioral and mental health EMRs can be broken down into two main steps. The first step involves assessing your needs. The better you understand your EMR requirements, the more likely it is that your purchase will pay off, both clinically and financially. The second step involves evaluating potential EMR vendors using your list of needs. At first glance, it’s difficult to differentiate one specialty EMR system from the next, much less rank them. But if you carefully adhere to your requirements, you can find an EMR that makes it easier to share patient records, improves your billing process and makes health records accessible to anyone with a mobile device. What Type of EMR Do We Need? How many of our clinicians need access to the EMR? Does our behavioral health subspecialty (e.g. substance abuse treatment) call for a customized system? Do we have enough IT support to manage an EMR in-house, or would it be better to subscribe to an EMR online? Do we need a specific behavioral health EMR, or will a medically-focused EMR meet our requirements? It’s a truism, but it bears repeating: the better you understand your EMR requirements, the more likely it is that you’ll get the system you want. What Do Our Clinicians Need? What do our providers like and dislike about the current EMR (if you’re replacing an existing system)? What features and functions would our clinicians like to see in a new EMR? Why? Does the system we’re evaluating let users design templates for documenting their clinical encounters? Does the system provide tools for customizing their workflows? What steps have other behavioral health organizations taken to be sure that their EMR meets provider needs? Sadly, many organizations don’t listen to their frontline clinicians, so they end up buying EMRs that they can’t or don’t want to use. Don’t make this mistake. What are Our Financial Requirements? What’s included as part of the EMR purchase price? Is it more cost-efficient to provide our own user training, maintenance and tech support for the EMR system, or would we prefer to pay the vendor for some or all of these functions? Are we willing to pay more for certain features, or do we need to stay within a predetermined level of spending? What does the EMR vendor charge for customized modules that add to the system’s functionality? Be aware that buying an EMR isn’t unlike purchasing a new car. If you’re not sure what you’re able to spend, and what the price should include, you’re not likely to get the best deal. You don’t want to end up paying for add-ons and services that you don’t need. Do We Need Additional Help? Should we hire an outside consultant to gather information on clinician requirements? Will we need to bring on part- or full-time IT professionals to take care of the EMR implementation or maintenance? If so, would it be more or less efficient to hire an outside IT consultant? Can we find someone in-house to train users on the new EMR system, or should we hire an outside expert? Do we need to retain an attorney to participate in our EMR vendor negotiations? No matter what size your behavioral health organization is, buying an EMR represents a big investment for virtually any organization. But by identifying your key requirements — and issues that might otherwise have gone unnoticed — you have a much better chance of making your behavioral health EMR investment a success. The company’s core offering is the CareLogic EMR, a web-based system designed for behavioral health and human services organizations. Its features include an electronic patient record and billing engine, along with quality improvement, reporting and administrative dashboards. Other capabilities include front desk tools, referral management and service requests via a point of entry module. CareLogic also generates claims automatically, with patient service documentation feeding into the billing engine once clinicians complete their services. In addition, the EMR allows patients to create custom service documents and forms that reflect their specific needs. NetSmart takes a very patient-centered approach to its EMR. It builds on its CareFabric platform, which offers solutions for addiction treatment, behavioral health, child and family services, home health, hospice, private duty and palliative care, intellectual and developmental disabilities, long-term care and public sector/public health. Netsmart also offers a set of revenue cycle management services supported by its RCM consulting team, and its care management solution supports care coordination and population health data. Cerner is an enterprise EMR vendor whose business focuses primarily on hospital clients. The company’s approach to behavioral health is to meld this data with data from other providers, including hospitals and long-term post-acute care centers. It integrates behavioral health with these other providers to care for patients across the continuum of care in an effort to avoid medical errors that can occur during times of transition. AdvancedMD specializes in independent private practices. Deployed through the cloud, the system is fairly easy to implement. As you’d expect from any medical software vendor, it automates several manual tasks. But what makes AdvancedMD one of the best is its wide range of functionality. In addition to practice management, it also provides EHR, patient experience, revenue cycle management and financial reporting capabilities. There are also lots of medical billing functionality, which help you manage niche aspects of the process, such as ICD-10 diagnostic codes. AntWorks’ EMR solution offers a fully certified EMR and EHR. At first glance, it appears to be a general EHR. However, the system comes equipped with thousands of templates made for all kinds of medical specialties. Even better, each of those templates is customizable, so you can ensure that your needs are met. And to top it all off, Antworks provides live support from the US in case you need any help working with the system. The athenaOne suite is an all-in-one medical software system, featuring practice management, EHR and EMR. Deployed on the cloud, the system offers features such as revenue cycle management, industry compliance and medical billing. Additionally, athenaOne has integrated systems that streamline billing, record-keeping and patient communication. The athenaCollector system handles billing and claims, athenaCommunicator provides a patient portal for communication outside of the exam room and athenaClinicals manages EHR/EMR tasks and Meaningful Use. CAM from Celerity is another cloud-based behavioral and mental health EMR solution. To ensure they meet your specialty needs, the system is fully customizable and integrated. Overall, CAM aims to save time and effort in your day-to-day operations. For example, it eliminates double-entry throughout your charts and includes an integrated treatment planner that can handle family-related goals. CAM even pre-populates your discharge summaries by pulling diagnoses, goals, number of sessions and other information from your records. InSync’s healthcare solution is a great option for behavioral and mental health providers of all sizes. Whether you’re a solo practice or part of a large, multi-location, multi-specialty practice, INSync can manage your EMR needs. It’s deployed on the cloud (like most of the systems on this list), making it easier to integrate and implement. The mental health features of the system are particularly robust, allowing for patient engagement and easily scheduling of group therapy sessions. Kareo’s practice management and EHR/EMR suite is another system that works for practices of all sizes. There are several pricing tiers offering various functionality, so you can choose the options that’s right for you. Kareo has a fully-functional mobile version that works with iOS so you can use the system on almost any device — evan an Apple Watch. There are also plenty of templates for behavioral health and mental health that you can pre-populate with information from a previous note or bill. NueMD’s integrated medical software suite is one of the most robust options out there. The system provides practice management, medical billing, EHR, EMR, ePrescribing, eLabs and a patient portal, to name a few features. The system is mobile-ready for iOS and Android, so you can use almost any device you like when working with patients and their information. And if you want to see an overview of our billing and claims, you can create customized reports. Echo Group’s core product is the Visual Health Record/Clinician’s Desktop. Clinician’s Desktop, which is certified for Meaningful Use Stage 2, offers a predefined treatment plan content builder, a form designer and reporting tools. Customers can host the software themselves or access it via the cloud. Its products are certified for compliance in reporting data to Meaningful Use incentive programs. SimplePractice is designed for therapists, social workers, psychologists and counselors. Its features include support for progress, chart and psychotherapy notes, ICD-10 autocomplete, treatment plan tracking and support for mental status exams. It also offers credit card processing, autopay functions, electronic claim filing, a secure messaging platform and a patient portal. The TherapyNotes platform includes both practice management and EMR software. The system includes the ability to track clinician schedules, patient appointments with corresponding notes and billing within the scheduling software. Its EMR-based note-taking features are built around forms designed for psychology, therapy, counseling, social work and psychiatry. This includes form-based note templates for treatment plans, progress notes and psychological evaluations. Therapy Notes’ practice management functions include one-click electronic claims submission, direct receipt of Electronic Remittance Advice from some insurance companies, credit/debit/HSA card processing and the ability to generate patient statements, superbills, CMS 1500 forms and financial reports. Generally speaking, these systems are similar to those listed above, but for varied reasons they haven’t experienced the higher visibility that the top seven systems have. This may very well be due to the large number of EMRs available on the market rather than their quality or ability to meet the specialized demands of behavioral health organizations. 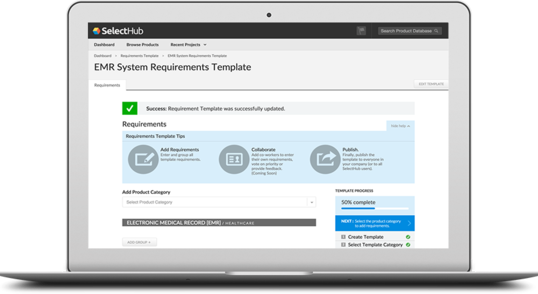 Ultimately — and we can’t stress this enough — you need to adhere to your EMR requirements list in order to guide your vendor choices. Sometimes a lesser-known system will serve a behavioral or mental health practice’s needs as well as those developed by vendors with a larger marketing budget. If your organization knows what it needs to support its clinicians effectively, you’re far more likely to end up making the right choice among the many behavioral and mental health EMRs on the market. Every organization has different workflow patterns, different clinical styles and different administrative issues to address. If you thoroughly screen several EMR vendors against your specific requirements, your investment is likely to be a success. I like your list. I’d like to add that it’s incredibly important to get references with potential EMR vendors and check out their online reviews. People who have done business with them before can give you a great indication of what to expect from that specific vendor. Thanks for reading and contributing your thoughts Blaze! Reviews are definitely key to making sure you choose a vendor that has a good track record with other clients. That being said, people do tend to leave reviews more frequently if they’ve had a bad experience than a good one, so we recommend always taking reviews with a grain of salt.